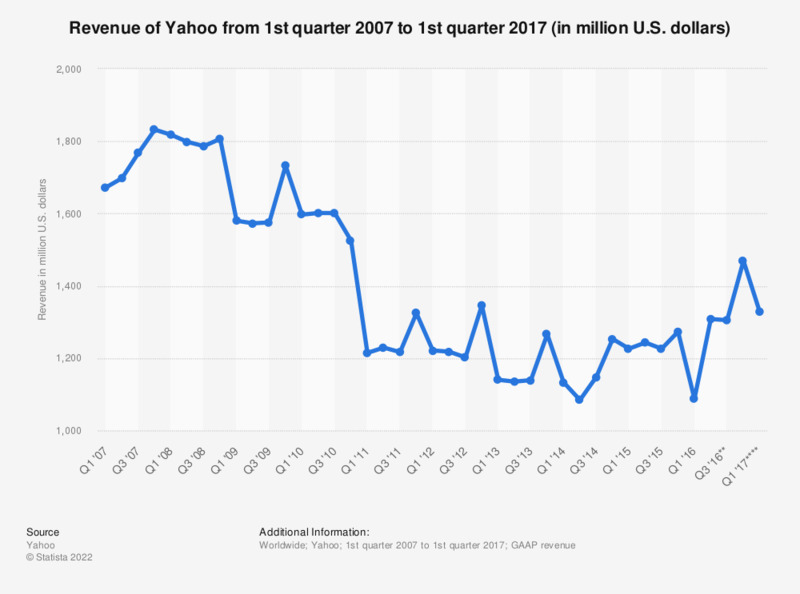 The timeline shows the quarterly revenue of Yahoo! in the period from the first quarter of 2007 to the first quarter of 2017. In the most recently reported quarter, Yahoo's GAAP revenue amounted to 1.33 billion U.S. dollars. *Q2’16 includes $252 million attributable to the Change in Revenue Presentation **Q3’16 includes $258 million attributable to the Change in Revenue Presentation. ***Q4’16 includes $302 million attributable to the Change in Revenue Presentation. ****Q1 '17 includes $304 million attributable to the Change in Revenue Presentation.